Résultat de plusieurs années de recherche et de tests, l’ART100 répond aux critères les plus exigeants en ce qui concerne les composants dernier cri de la haute fidélité. C’est un amplificateur universel conçu pour pousser les charges de basse impédance ou complexes, comme les systèmes les plus puissants. ARTEC France, bien consciente du fait que les transistors complémentaires ne s’assortissent pas parfaitement l’un avec l’autre, a développé un principe semblable aux amplificateurs de à lampes (tubes) qui utilise seulement des paires de transistors avec la même polarité. Pour éviter toute perte de puissance inutile, ARTEC France a développé une classe glissante afin d’éviter les problèmes connus rencontrés sur les systèmes avancés de commutations en classe A. L’excellente exécution de boucles ouvertes (loop) de l’ART100 lui permet d’avoir peu de contre-réaction négative (environ 15dB), et garantit, dans ces conditions, une remarquable qualité de haute musicalité. En fait, le gain de boucle ouverte à 23 kilohertz est -3dB avec une impédance interne de rendement d’environ 0,05 ohms. Et tout ceci sans rétroaction négative. Double mono, il vient équipé de 2 transformateurs toriques, chacun ayant plus de 500 VA.
ARTEC France accorde beaucoup d’importance au type d’alimentation d’énergie. Il y a 8 unités d’alimentation en tout dans l’ART100 et chacune est indépendante et stabilisée électroniquement. Ces alimentations d’énergie ont une grande bande passante (plusieurs mégahertz) qui permettent une amélioration transparente des mi-aigus. Leur basse impédance leur permet de capturer les sons particulièrements bas. Puisque la musique se compose la plupart du temps d’impulsions, l’ART100 a une puissance dynamique très élevée, plus de 500 W de poussée pour 1 ohm. Cette technique permet d’abaisser le nombre de transistors et, en conséquence, d’avoir des performances accrues dans le médium et les hauts aigus extrêmes. A product with an outstanding musical quality. In our opinion, it’s the best currently existing high-power transistor amplifier. Perfection, riches and authenticity of tones….Even among the overseas-made prestige devices, not any reaches the incomparable features of such system. It is shown as the current reference in the transistor amplifier field. Designing an uncompromised transistor amplifier in France is not an easy job. So, we can only foster this young company from ALBI, France, which offers a remarkable unit whose circuit configuration is really out of the ordinary with a rare subtlety being observed when hearing. We actually see a number of amplifier prototypes from companies under creation or achievements sometimes with no future passing by, which do not offer anything approaching the musical veracity. Therefore, when a serious-minded company gives us the possibility to discover an amplifier which may easily compete with the best worldwide achievements – this should be clearly said – and such is the case of the ART 100 amplifier whose subtle tone balance, sense of nuances, intelligibility of more complex messages overrun quite widely the highest standards in that field. The ART-100 power unit comes up in the form of a highly rigid frame with a 5 mm wide, aluminum, 19″ standard front panel being the same as the unit rear panel accepting the different speaker output sockets and power cord. The unit’s top and bottom section are made of high-thickness steel sheet which, when combined with the aluminum front and rear panels, eliminates certain forms of magnetic distortion. 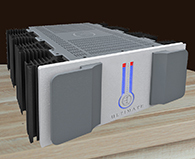 Large heat-dissipation radiators are placed on both sides of unit providing an efficient temperature stability even under high-stress conditions. The on/off switch as well as the three indicator lights are located on the front panel. For all over the time delay period just following the energizing, the current stabilization as well as the absence of output offset, a yellow light comes on. The other lights are related to protective systems and especially that detecting any abnormal overheating revealed by a red LED. Until the temperature is not back to the normal operating range, no modulation in output configuration is involved and the red LED remains on. When the temperature has decreased, the diode comes off and the modulation is delivered again to the speaker terminals. The designer, Mr. Jean Pierre Voiturier is against the electronic protections on the modulation way which always modify the final musical quality with a loss of definition. So, against accidental short-circuits, a passive protection is achieved with fuses, being accessible inside the amplifier on the central card and placed before the filter capacitors as fuse impedance is not linear. With only such a detail, it may be already observed all the reflection which lead to the achievement of this amplifier. Speakers’ output sockets, which have the same blue coloured channels for (+) and (­), are located on rear panel. We may wonder why doing this, but the manufacturer wanted it so to draw the attention of users who would possibly perform any measurement. These speaker outputs are not actually referenced with respect to ground; they are commonly referred to as being « floating ». So, if any measurement is wished to be performed on the ART 100, the measuring devices should be connected in differential mode. Of course, terminals are fully identified by the + and – signs. The Cinch input sockets are extremely high quality sockets. When such 100-W-per-channel amplifier is lifted up, one cannot help but be struck by its weight of about 27 kg! When removing top cover being bound up with part of side covers, we realize that it is a real dual mono design and we are surprised about the mains transformer size. There are actually two 500-VA ring transformers per channel with an electrostatic screen so as to avoid stray capacities; each of such transformers is dedicated to the power stage corresponding to a channel. For input stages, a third transformer with double secondary winding is being used. For the main power supply, located before the transformers, a Sheffner type power filter which should play an important function in the pureness impression of the low-amplitude signals. The main post-rectification power supply filtration is provided by two 10 000 µF capacities each. But one of the originalities specific to such amplifier lies in the two supplies being voltage-stabilized for power stages. Such voltage-stabilized supplies may be assimilated to amplifiers; they are installed in shielded units. For input stages, power supply is also controlled and stabilized. It is one of the fewest times that voltage-stabilized supplies for both input stages and power stages are encountered in an amplifier. They are extremely widely dimensioned so as to avoid any secondary « pumping » effect. Being thereby supplied with a very high stability and a high pureness, the various signal processing circuits may operate on an extremely wide dynamic range. As an extremely brief outline, the circuit configuration is as follows: the input stage is a differential based on cascode-mounted Fets which then initiate a current mirror circuit, followed by a cascode-mounted, driver V-Mos transistor initiating the output stage fitted only with six bipolar Motorola-made transistors having all same polarity. The output is a floating output being unreferenced with respect to frame. An extremely low negative-feedback rate of about 14 dB is applied. The designer revealed us that in open loop configuration the frequency response already rose up to 22 kHz, and when in closed position, up to 100 kHz (limited by a filter in input configuration). Power stages run in Class A though with a variable polarization system. The transfer function actually varies depending on musical-signal amplitude. Switching phenomena at an extremely low power are thereby eliminated. The design is superbly achieved with top quality components which were also selected depending on their listening quality. So, nobody will be surprised to find out metal layered resistors, stereoflex type capacities, 50 ~m thick track printed circuits and 70 ~m ranges for extremely wider ground tracks. Circuits are connected each other by 2 mm2 cable strands fitted with high-precision automobile connectors. Connection between the output stages and banana plugs is achieved using 4 mm2 Monster Cable. We have been much impressed by the insertion quality as well as the serious-minded manufacturing attitude being worth representing the world best achievements. As the ART 100 amplifier is provided with floating outputs unreferenced with respect to frame, we experienced a few connection problems with our measurements devices which may have some effects on the distortion values (capacitive phenomenon). The rated output power being announced is overrun by 22 W and we may count on 2 x 122 W at 8 n. The distortion values being recorded on different frequencies should be assumed by considering the remark mentioned when initiating this chapter. So, under ideal conditions, due to the amplifier design, and on Neutrik measurement bed with floating-output generator, the distortion in high frequencies at 20 kHz is inversely decreasing. The average rates are approximately around 0,030 % at any frequence and any rated output. The signal/noise ratio is excellent with 115 dB in linear configuration, and we did not observe any power residues at low frequencies. The square pulse shape does not call for any specific comment, neither any risk of oscillation, nor any overload are to be encountered. Another important point: both channels have an absolutely similar performance. The 3.5 ~s rising time is correct as it corresponds to a 100-kHz voluntarily-limited frequency response. The designer specifications are largely met and no operating trouble could have been observed during measurements. Listener A: The ART 100 is the outcome of research activities performed by a team having a tremendous passion for High Fidelity, people for which everything seems to converge on such same and single goal. This purist’s initiative involves all the risks we know as the final step is having inevitably a product whose price corresponds to a very small market sector. In a sector where competitors are numerous, the most fearful ones are the big firms which mainly consider this line only a state-of-the-art operation for impressing competitors and boosting up the brand reputation. If the system is based upon a number of very efficient ideas, those were applied with so much accuracy, refinement that the objective being set by designers was fulfilled. Electronics cancels to offer a real musical delight, a rare-fidelity sound transcription. Each sound recording provides characters, sound colours being specific to it. Instruments are not only attractive with a perfect harmonic balance, but they still reveal to be every time different depending on recordings. The same remarks apply to the perspective effect which, from one sound recording to another, show either glorifying atmospheres, or the strong presence of soloists, or else acoustics from big concert halls emphasizing on the rising tension of some symphonic works. The merit of such exceptional amplifier is to enable the discovery of music, voice, soloist subtleties being too often hidden, the melodies’ beauty, the flexibility, support and warmth of accompaniments, or else contrasts and famous orchestras’ vitality. As expected, the subjective frequency/level response curve is almost straight. Definition and dynamics are extended and equal in every register and are not altered at low and high level. 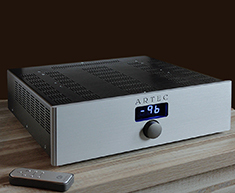 Then on, ARTEC’s ART 100 is part of top-quality leading amplifiers. The only thing such serious-minded designer will have to do is imposing his brand, which, paradoxically, has almost nothing to do with the sound quality. Listener B: We were highly interested when listening to such prestigious French achievement whose original circuits provide a real asset in the sense of musical nuances being correctly met. In our opinion, it should be allowed the ART 100 to warm up for at least half an hour so that it reaches its ideal tonal balance as well as a well-developed and nervous low note. What immediately strikes you, is the low note quickness with level deviations properly fulfilled below 200 Hz and a total absence of masking effect on the low-middle. The area between 250 and 1000 Hz appears to be highly delicate, extremely refined at tone level, with a big aeration feeling. The middle is splendid as it combines both softness and accuracy with, when required, impetuses of a rare violence. Neither an overexpanded sound effect on voices, nor a projection when increasing loudness, are encountered. In highly difficult tests involving the concert piano, the artist touch is respected with a surprising articulation between notes and a great feeling of depth certainly related to the optimal decline in tones over the time. Similarly, on stringed instruments, the differentiation between the tonal colour of violins, violoncellos and basses is remarkably rendered with a total absence of aggressiveness on high notes. On percussion instruments, even in the high note, the notes’ evolution in time is superb with a highly-accurate geometric spreading-out in space. So, the steel disc of a cymbal maintains a credible diameter and is not converted into a toy. This is certainly due to a very linear energy distribution up to the high frequencies (consider here the benefits of various stabilized powers). In the very difficult sea noise test, requiring a correct dynamics distribution of the infra-low note up to the extremely high note, wind noises as well as the infra-low note of ground swells pass with an incredible acuity and with no intermodulation effect on small signals of droplets falling down on the shore. Such very difficult test also demonstrates the advantage of having a Sheffner filter incorporated into the amplifier, as no background noise comes to « destroy » the small information and, in addition, provides an extraordinary opening. 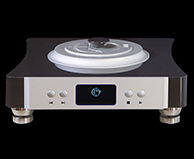 One of the most exceptional points of this amplifier is actually that the distance between the various sound planes, is perfectly fulfilled and changes entirely from one sound recording to another, thereby demonstrating the ART-100 neutrality. The highly successful tonal balance enables to cover both high-output funnel type, pressure chamber loudspeakers and electrostatic panels with always such absence of aggressiveness and such tremendous power of intelligibility even on complex overriding information. Just a few amplifiers can have such separating capacity with such respect of phase. No doubt that the three years’ tuning up of such amplifier were not useless; it looks like being one of the most music~l transistor achievements ever encountered at the moment, without especially forcing some features, but, on the contrary, by finding out the right balance between multiple contradictory parameters. As the ART-100 ranks among the first best worldwide achievements, testing it and listening to it is essential, with high-output loudspeakers as well as with isodynamic or electrostatic plane systems. Moreover, from what we may estimate with respect to the design quality, the reliability should not be called into question. Toutes les informations sur le Artec ART100 en téléchargeant la fiche produit au format PDF.